I bought my shiver 2 weeks ago and already have over 1500 miles on it. I hadnt yet checked the valves, and given that I wanted to learn more about the engine, i decided to dive in. I havent seen a close up description posted anywhere, and the pictures in the service manual are small, so I thought I would take photos to share what I find. It is essential you do this check on a cold engine. Let the bike sit over night, or about 8 hours, after riding to ensure it is cool enough. Checking the valves is easy, but adjustments require removing parts that could allow the timing to shift and make the bike to be unrideable. I recommend you consult the Aprilia service manual for more details. Hopefully this guide will make visualizing the task easier. To get to the valves, you need to remove quite a few parts. Go slow and take it easy, and you will be able to accomplish this in a few hours. Between doing the work, taking pictures, taking breaks, and helping my wife work on her SV, this whole job took me about 5 hours. My valves turned out to be in spec, so I didnt need to remove the cam shafts or adjust the valve clearances. That would have added more time. First things you gotta remove are the fairing pieces from the fuel tank. There is one piece around the ignition switch, and three pieces on both the left and right side of the tank. Be sure to also remove the bolts to the left and right of the ignition that hold the front of the tank down (shown with yellow arrows). Once you have the fairing pieces off and the front of the tank loose, you can pivot the tank up. If you can, remove the braided drain hose from under the left rear part of the tank. I didnt do that and had some tension pulling the tank up until the hose released. The nylon braided hose is attached to a tray under the fuel valve that collects drips of fuel and routes it around the hot engine. This shows the fuel hose disconnected from the red fuel valve. The collection tray is laying below, on the cylinder head cover. After the hoses have been disconnected, unbolt the tank and remove it. You will then see the top of the rear cylinder head between the battery and airbox. Remove the four head cover bolts, and the spark plug boot. Then remove the bracket holding the battery in place and slide the battery up to provide clearance for the head cover to come off. Below is what you will see under the cover. The valves are covered with a pair of cam shafts, each with a gear attached to one end. The shafts are turned by the action of a third gear that is powered by the cam chain. The gears and cam chain are visible towards the bottom of the photo above. At this point, I checked the valves on the rear cylinder. To check the valve clearance, you need to get the cam lobe off of the top of the valve so that it isnt compressed. The easiest way to do this is to shift the bike into 6th gear and rotate the rear wheel while up on a rear stand. It is even easier to turn the wheel if you remove the spark plugs. I rotated the rear wheel forward, as that is the way the engine turns. A mechanical engineer buddy says it is OK to turn it in reverse too, but I didnt do that. When you turn the wheel it will turn the cams. You want the cams to wind up in the position shown below - note the cam lobe pointed away from the top of the valve (yellow circle). There is a second cam under the cover that can be checked through the window (yellow arrow). In case you havent checked valves before, this is the tool you need. It has many shims bound together, each of a different measured thickness. The ranges you will need are listed at the top of this how-to. The measuring procedure is to put a shim between the cam lobe and the top of the valve. The shim that fits with ust a slight drag is the correct measurement. If a shim doesnt fit or fits very tightly, then it is too big, so dont try to force them into the gap. If it gives no resistance, then it is too loose, and the next largest size shim should be tested. While doing this work, be sure to do the other inspections. My coolant level was too low, so I topped it off with a 50/50 mix of anti-freeze and distilled water. Dont trust the people who set up your bike - verify levels yourself! To access the front cylinder, you will need to get the radiator out of the way. Remove the two bolts holding it on to the frame and horn bracket. Also remove the bolt holding the reservoir to the frame, and slide the radiator off the peg on the right side of the bike. You will then have slack for it to dangle down out of the way of the head cover. Left side view. You can see where I have removed the evap canister and bracket. Good riddance! View of right side. the dangling reservoir kinda blocks the view, but provides the necessary clearance. After removing the 4 head cover bolts and the spark plug boot, you can remove the head cover. If it is stuck on (likely), you can tap it with a rubber mallet to loosen it. NEVER use a metal hammer to loosen it, as you would likely crack or damage the head cover or cylinder body. Again, with the bike in 6th gear and up on a rear stand, rotate the rear wheel forward and get the cams rotated off of the valves. Then you can test with the clearance measurement tool like shown below. All of my valves were within spec, so I didnt go any further. The only way to adjust the valves is to remove the cam shaft covering the errant valve and replace the shim under the bucket. To remove the cam shafts, you will need to remove the housing covering the shafts, with the opposite shaft pinned in place with a 6mm pin through the gear. Since I did not perform any adjustment, I will leave it to someone else to show the procedure to safely remove the cam shafts. I dont plan to open the heads up again until the 12k mile check. Sorry I couldnt go any further, but if it aint broke, dont fix it! While I had everything apart, I added a longer vent hose to the tank to make up for the one i removed while removing the evap canister. To do that, I needed to separate the painted plastic cover from the black plastic tank. Below are pics of the two pieces, for the curious. Sorry to bump this, but I'm in the middle of valve clearance check and looking for some clarification. When checking the clearances, does the cylinder have to be at top dead center, or just at any point where the cam is not pressing down on the valve? I Got everything apart and measured just the rear cylinder exhaust valves and they are way off, so i think I'm doing something wrong. The engine was not at TDC but cam is off the valve, and they were reading between .05 and .10mm (should be .16-.23). I'll try again tonight at TDC but looking for some clarification in the meantime. For those of you that did have to adjust, how far off were they? Measure the clearance when the lobes are facing 180 degrees away from the buckets. That's cam lobe up. Also double check your math unless you are using metric feeler gages. Measure twice. Saves rework later. Mine has not needed shimming. Checked twice in the last 24,000 miles. Sorry, a couple dumb questions. ... You want the cams to wind up in the position shown below - note the cam lobe pointed away from the top of the valve (yellow circle). There is a second cam under the cover that can be checked through the window (yellow arrow). 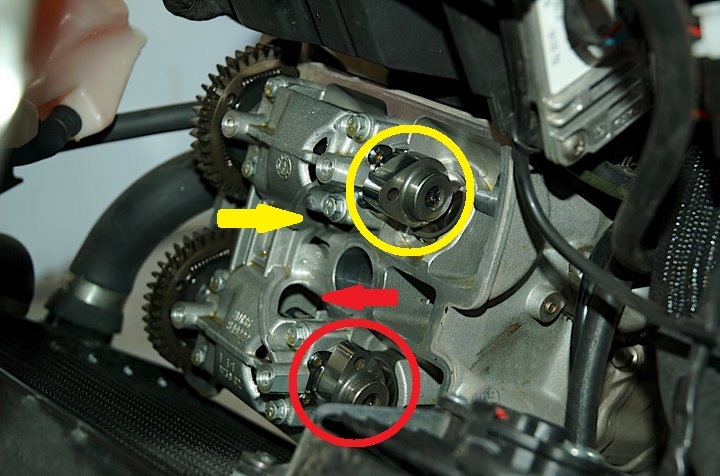 The cams shown with yelow circle and arrow in the rear cylinder picture above - are they both intake? Are they the right intake and left intake respectively (i.e. yellow circle is right and yellow arrow is left)? Are the red circle & arrow I added to Pete's picture, as shown below, both exhaust cams (right & left respectively)? Should both the Intake (left & right) be checked to be within specs? Intake: 0.11 - 0.18 mm (0.0043 - 0.0071 in). And, for the front cylinder picture below (my edit of Pete's original), pretty much the same thing? the side of the outlet is the also the side of the outlet of the valves. I am wanting to remove the evap canister as well. Where did you route the replacement tubing? Did you route it from the 90 degree union around to the throttle body? Hey, I got .229 mm on the exhaust , should I do something ? thanks ! That's on the limit of 0.23mm. Given that clearances tend to reduce over time and a little too much clearance is better than a little too little, I'd be inclined to leave it. Bump! Can someone please tell me the position of intake and exhaust that venk indicated above right or not? The exhaust cam is closest to the exhaust pipe and the intake cam is closest to intake manifold. These are on the opposite positions in the front and rear cylinders. On the front cylinder head, the exhaust cam is on the front; on the back, it is on the back. Each cam operates two valves, either both exhaust or both intake. In Venk's last photo of the front cylinder (with the radiator), he has the description correct. Red is exhaust, yellow is intake. I can't be confident with the photo of the rear cylinder as it is not clear which is the front of the bike. I think he has it correct. Now i got it, very simple,"the exhaust cam is closest to the exhaust pipe" and th other ome is intake cam. 2. "You have to lock 1 cam and measure the other"
Why i have to lock opposite camshaft? Why not the camshaft which i measure? as i understand: timing pin will lock the camshaft at right position then take off the cover and camshaft to do the shim adjustment? after that, use timing pin to put the camshaft in right position. But how to do with 2 camshaft? And how to put the cam chain in without moving the camshaft. i've read all your comment but something i can not understand even i read them many times. * Top dead centre (TDC) is when the piston is at the top of the stroke. This occurs once every 360 degree rotation and once every 720 degrees it will be at TDC on the compression stroke. At this point the valves will be closed and so clearances can be measured. The motor can be rotated using the rear wheel in top gear or using a socket on the end of the crankshaft after removing the plastic plug on the left hand side of the engine. Remove the spark plugs before trying to rotate the engine. Rotate it until it is TDC. There will be a timing mark inside the second small plastic plug on the left side of the crankcase. I did it by feel and sight as you can feel the piston going up and see the cams rotate closing both valves. Inserting the cam pin conforms TDC. * You must lock the remaining cam when you remove the other cam to change the shims. Otherwise you will lose cam timing. You do not need to do this when measuring clearance. The advantage is that you can be sure that the motor is at TDC when the pin fits down the hole. * When both cams are fixed in place, the cams will only move when the engine moves. 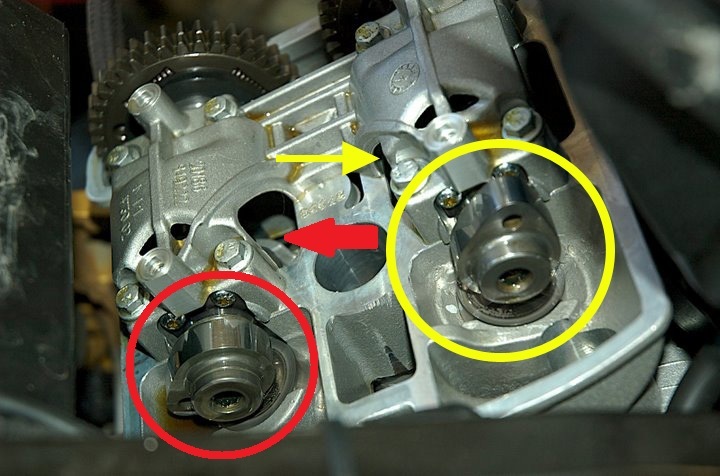 However, when you remove one camshaft to change the shims, you must lock the other camshaft using the pin to stop it moving and losing cam timing. I found that I needed to cable tie the remaining camshaft on the front cylinder because the angle of the cylinder meant that there was a risk of the remaining cam rolling forward, even with the pin in place. I posted a photo, I think in this thread. Someone had the good suggestion to use a second pin to help guide the second camshaft when put it back in place. * Hope this helps and good luck. I appreciate your kindness and enthusiastic. So happy when knowing more thing: TDC. So i just find the right time to insert the time-locking pin, the job is certainly right when the pin fits down the hole, right !? (do i have to check both 2 holes of the camshafts or only 1 hole is enough!? ). I don't see any photo about Cable tied the camshaft, can you please repost it !? Ps: How to remove the cam chain without losing the timing. When i remove the camshaft for adjusting shim, should i mark the position with a pen or anything like that!? In the worst case, losing cam timing, what should we do!? * I found that both holes in the camshafts line up at TDC. So you would only needs to check one, but its little extra hassle to check both. * You do not need to touch the camchain when removing the cams as the cams are driven by a gear, not the camchain. This is visible in the photo with the cable tie. * Yes it would be a good idea to do this. From memory the valve adjustment thread suggests that this is done and provides photos. * Aprilia make a "template for timing overhead camshafts" to allow you to set the timing of the cams. Its easy enough to avoid having to use it! There will be more than one point where the pin fits in the holes. You will know TDC because as the piston comes up, none of the cam lobes will be pointing to the valves. And thank you for those pictures too. my maintenance job becomes easier rightnow. You know, i did ask some my friend about the valve clearances, but it seems that they are afraid of doing it although i've said this is the Factory's recommend. I'll go deeper in order to make sure no mistake comes. What did you mean :"There will be more than 1 point where the pin fits in the holes !?" and"None of the cam lobes will be pointing to the valves" !? Can you explain them for me !? The hole for the pin goes right through the cam, so it should fit at TDC when the cam lobes are pointing away from the valves. This is shown in Trikte's photos in the other thread. Note that on one cylinder the lobes will point slightly outwards and on the other, slightly inwards. The pin should also fit 180 degrees later, but the cam lobes will be pointing down, the valves will be open (at least partially) and you will not be able to measure the clearance accurately.